Powerful techniques, based on the Planar Laser Induced Fluorescence (PLIF) technique, are deployed to locally visualize and quantify the impact of surfactants in wastewaters on hydrodynamics and oxygen mass transfer. Bubble diameter, aspect ratio, rise velocity, contamination angle, as well as flux, flux density, liquid side mass transfer and diffusion coefficients of transferred oxygen are determined based on these techniques applied in the wake of rising bubbles of diameter 1 mm and through planar gas/liquid interfaces. The initial experiments were performed in demineralized water containing small amounts of surfactant. Different concentrations of surfactant were added to finally reach the Critical Micelle Concentration (CMC). Bubbles have classically been found to be more spherical with a reduced rise velocity in the presence of surfactants up to the CMC. Above the CMC, these hydrodynamic characteristics were found to be almost constant, although the oxygen mass transfer decreased due to the presence of surfactants. Experimental results were markedly lower than predicted by the well-known Frössling equation with rigid surfaces. This is believed to be caused by a barrier of surfactants hindering the oxygen mass transfer at the interface. 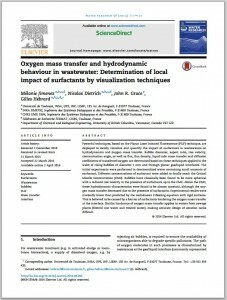 Similar hindrance of oxygen mass transfer applies to waters from sewage plants (filtered raw water and treated water), making accurate design of aeration tanks difficult. 2018 : Escape Classroom: The Leblanc Process—An Educational “Escape Game” – J. Chem. Educ.